A pithy, moving, and utterly fascinating verse drama with music by contemporary poet, Alan Shaw. There is a truly tragic and ironic movement to the piece . . . the lines are rhythmically and metrically expert. 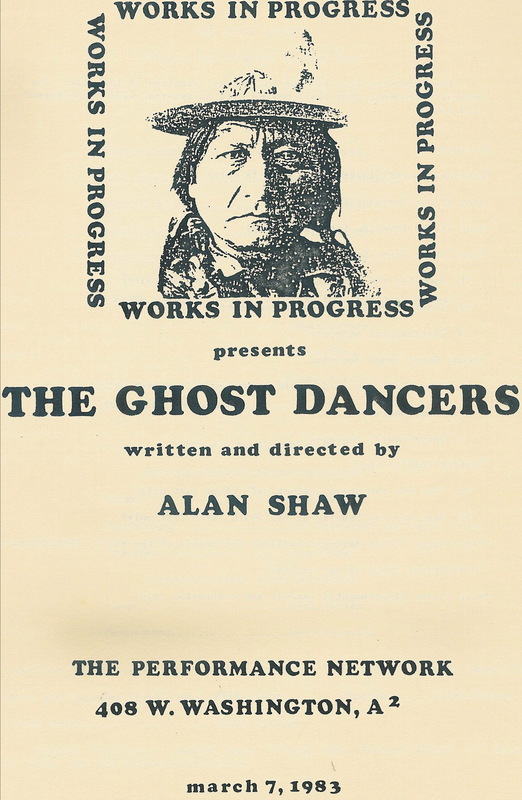 The Ghost Dancers is a play in verse, with a substantial musical score. The chorus is required to act and dance as well as sing. I began work on the play around 1977; a revised text was finished in 1981, and a partial score was done in time for some music to be included in a staged reading of the play at the Performance Network in Ann Arbor in 1983. This was a script-in-hand, fully blocked performance before an audience of about 60. That performance was well-received, but I knew it would be many years before a really satisfactory production could be mounted. I was lucky to be able to recruit some very fine actors for the reading, better certainly than any I could expect to get for a full production in the absence of funding. There were problems to be worked out with the score. I had no choreographer. The play did not fit comfortably into any of the usual genres. I knew what it needed, and was not eager to “workshop” it. The entire play text was on the old site, along with extensive notes for performance, a discussion of the historical and artistic background, and some audio clips of the music. I have taken all that down now. I hope to have better audio and video of some excerpts soon. Potential producers or other interested parties may obtain PDFs of script and score by emailing me directly. Audio clip audio clip from the 1983 reading. 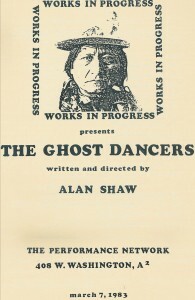 In this scene the Indian agent, White Hair, after having the Ghost Dance preacher escorted off the reservation, admonishes Sitting Bull, whom he suspects of instigating the dance. White Hair: Leo McNamara. Sitting Bull: Martin Walsh.